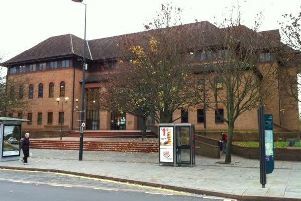 A jealous ex-boyfriend has been ordered to pay over £700 after he assaulted his ex-girlfriend and smashed her mobile phone. Chesterfield magistrates’ court recently heard how George Roper, 27, of Conksbury Avenue, Youlgrave, Bakewell, had accused his ex Louise Herron of being unfaithful and had demanded to see her phone before he assaulted her. Prosecuting solicitor Sarah Haslam told the hearing last Wednesday, September 21: “The couple had been in an on-and-off relationship for about nine years and they had separated many times. “On this occasion she had been to the gym and returned home and heard knocking and it was the defendant and he accused her of being unfaithful and asked to see her phone. Mrs Haslam told the court that the complainant claimed the defendant had left her physically drained and lacking in confidence to the extent that she has been scared to stay at home alone. Roper pleaded guilty to the assault and to damaging the phone after the incident in Chesterfield on April 21. Defence solicitor Ben Strelley said: “Mr Roper wishes the court to be aware that on the evening in question there was a communication between the two parties including texts and he went around about 10pm and the police weren’t called until 2am. Mr Strelley added that Roper had pulled the complainant’s arm when the phone had not been forthcoming and at a later point the defendant did break the phone. Magistrates fined Roper £266 and ordered him to pay £400 in compensation, £85 in costs and £30 in a victim surcharge. Roper was also given a one-year restraining order not to contact the complainant.